About: The Good Mixer serves traditional pub food, snacks and real ales. They have pool tables, quiz and fruit machines. Seating on the pavement area is provided, weather permitting. 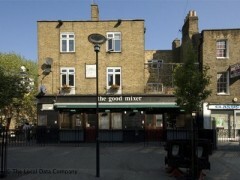 This is a great place to grab a drink if you are in Camden, its a relaxed atmosphere and there is a pool table. Very cool.